When four independent sources, sources who are friends, colleagues, and other trustworthy sorts, recommend a restaurant, it’s a fair bet that the restaurant is worth visiting. 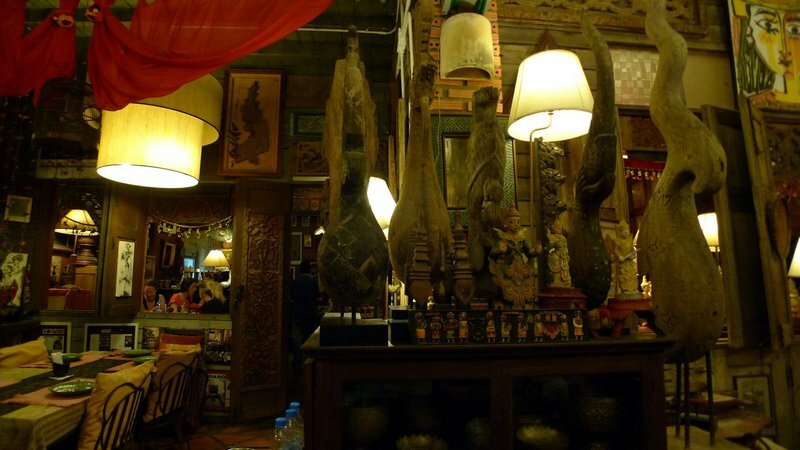 For our first dinner in Chiang Mai, we wanted to eat somewhere in town that was well-known for its Northern Thai cuisine. 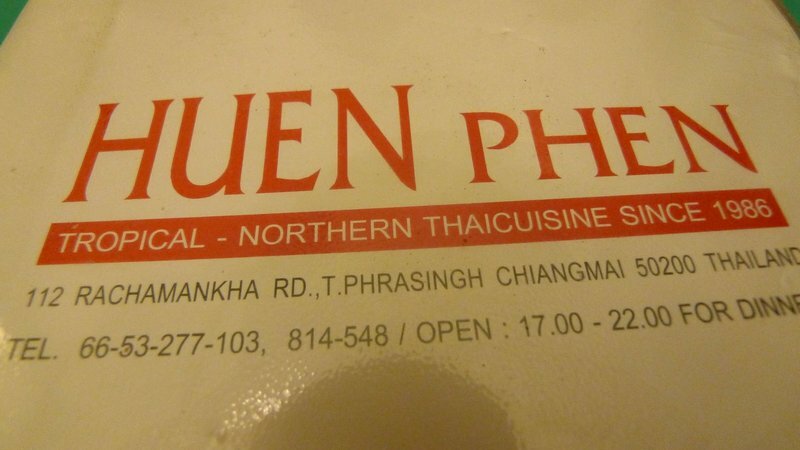 We ended up at Huen Phen, located on Rachamankha Road in the southwestern quadrant of the old city. There’s sort of a funny story about how we ended up here. Our first afternoon in the city, we met an American retiree friend, Vic, who has just recently moved to Chiang Mai from Bangkok. Vic is the sort of person who, shall we say, likes to stay in his comfort zone. When we met in the late afternoon, Vic suggested several restaurants we could eat at, all of which were branches of Bangkok chains, all of which were located in the city’s largest mall, and none of which featured Northern Thai cuisine. Somewhat surprisingly, we persuaded Vic to join us at Huen Phen. We almost lost him along the way, though. We didn’t have a precise address so parked in front of a nearby temple and asked some locals. They said the restaurant was several blocks away and recommended we drive there. Once back in the car, following their directions we headed down a small, dark side street. By this point, Vic was getting a bit skeptical. Tawn saw a sign for parking, though, so we pulled to the curb, parked the car, and then walked up to the main street. The exterior of the restaurant looked closed for business. Chairs were upturned on tables, the lights were out, and the gates were closed. 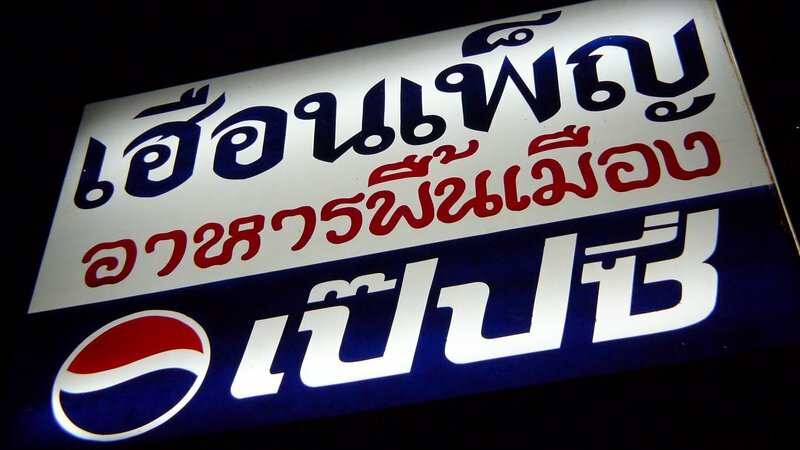 Only this illuminated sign (can you guess which cola company sponsors it?) and a single gate were open. As it turns out, there are actually two restaurants of the same name. The exterior restaurant, the one that was closed, is the lunchtime restaurant. It serves basically the same food but all prepared in large pots. 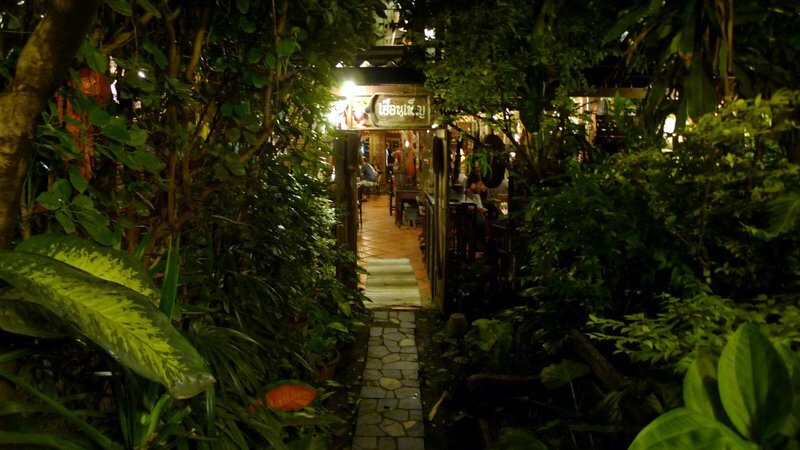 The dinner restaurant is located down this narrow path that passes through a garden. Only a chalkboard sign posted on an easel pointed out the way. It was enough to make you think they didn’t want to be found all that easily. 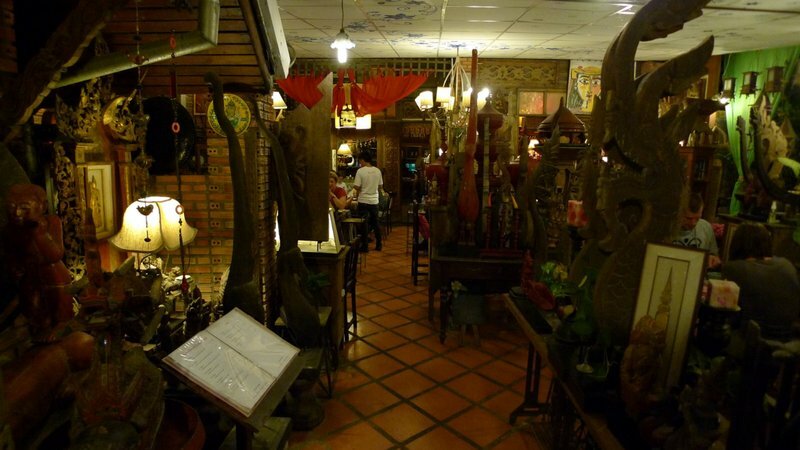 The interior of the restaurant is packed with antiques and bric-a-brack, mostly Thai in nature. In appearance it is like a Lanna version of TGI Fridays. We had to wait only a few minutes before we were shown to our tables. As busy as the restaurant was, I’d imagine reservations are a good idea. The crowd was mixed, although there were a lot of tourists. This is a worrying sign as restaurants that have too many tourists and not enough locals usually aren’t very good. Thankfully, though Huen Phen was every bit as good as all our friends, colleagues, and the employees of our hotel had promised. We ordered quite a few dishes, considering there were just three of us eating. This first dish, a Northern Thai classic, is nam prik ong. 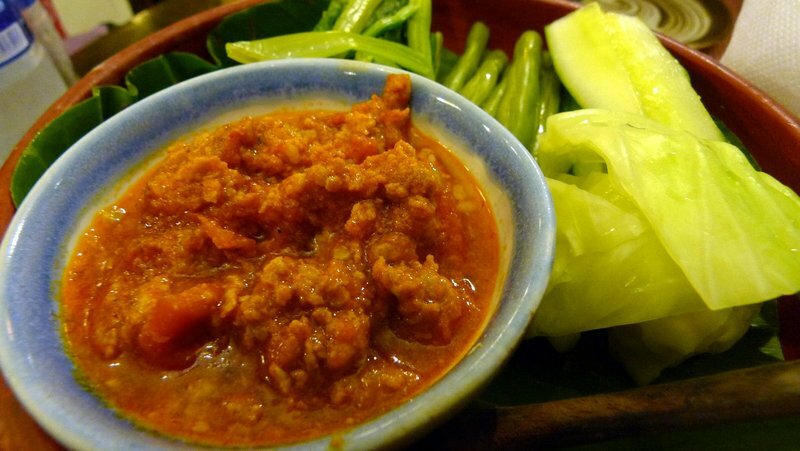 It is minced pork with tomatoes and is only mildly spicy. It is served with blanched vegetables and is eaten as a dip. The second dish was another type of dip called nam prik noom. “Nam prik” means chilli sauce. This is made from fire-roasted green chilies and the spiciness varies depending on how many of the seeds and how much of the seed membrane are left in. In this case, it was pretty darn hot. 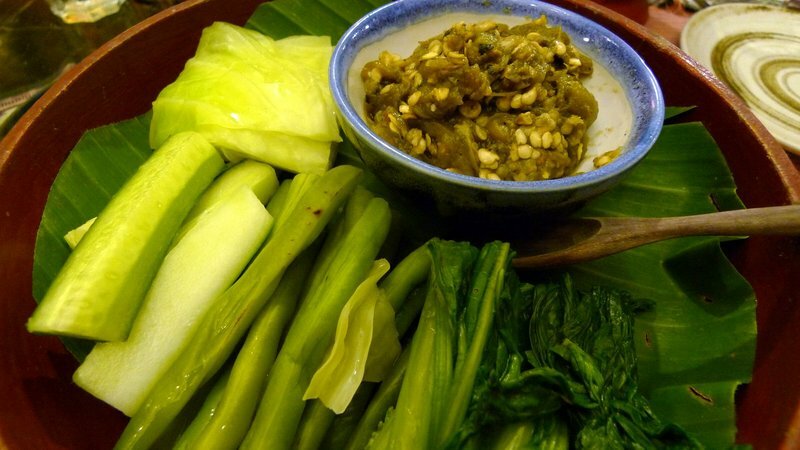 The use of nam prik is one way Northern Thais consume a lot of vegetables and it sure beats ranch dip any day of the week. The third dish, also served with some vegetables on the side was sai oua, the ubiquitous Northern Thai pork sausage flavored with kaffir lime leaves, lemongrass, galangal root, red curry paste, and turmeric. It is usually only moderately spicy. This is a favorite dish of mine because I think the very herbal flavor of the sausage is distinct and enjoyable. We also had gai tod, or fried chicken, seasoned with their special blend of herbs and spices. Very juicy and even finger lickin’ better than some other friend chicken recipes. 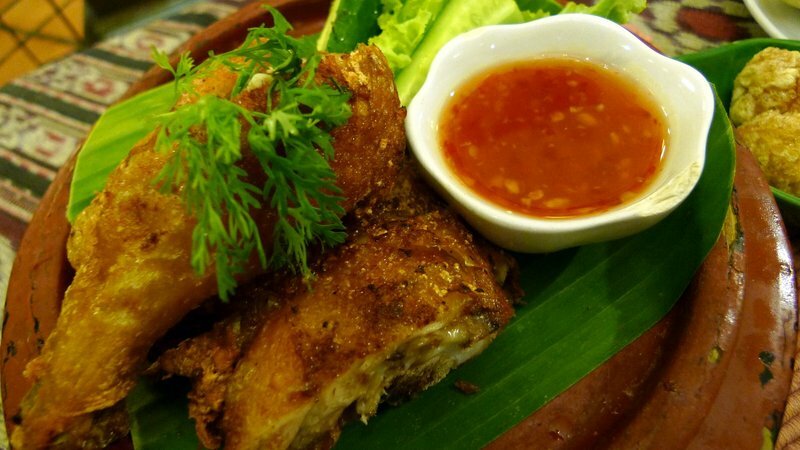 It is served with the sweet chilli dipping sauce that is common with fried chicken in Thailand. 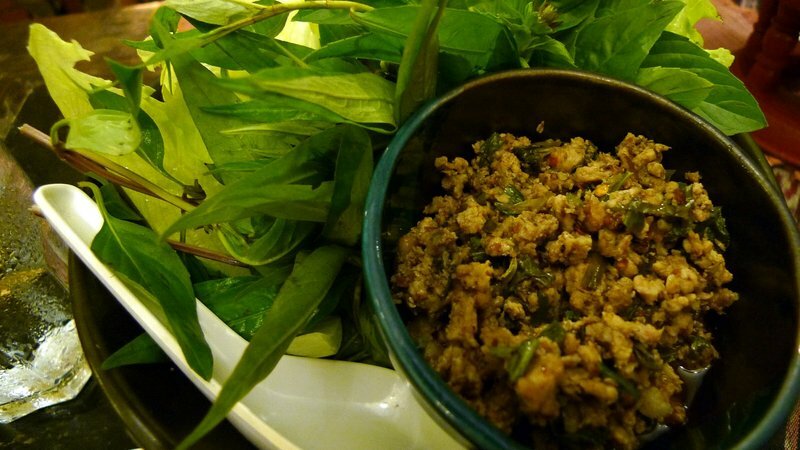 This is a version of larb muu, a minced pork salad that is actually more commonly associated with Issan, or Northeastern Thai cuisine. It is made with shallots, lemongrass, lime juice, and ground toasted rice. Very tasty. You may be noticing a theme here in the fact that meat is usually served as an accompaniment to vegetables, not as the main attraction. 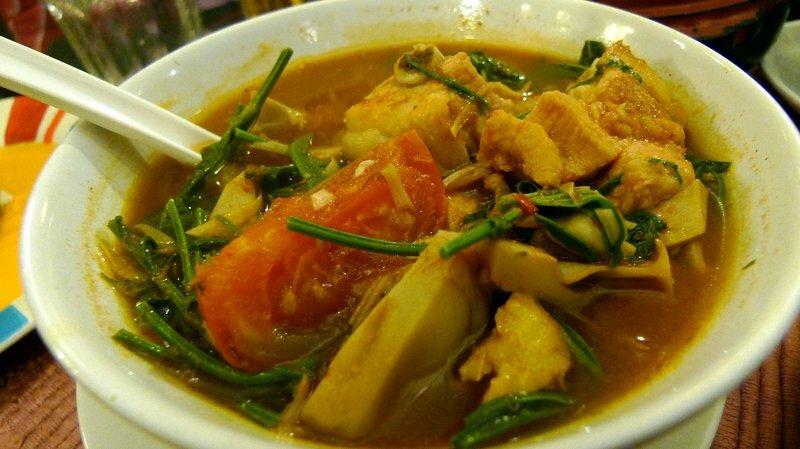 A dish that I’ve never tried before and we thought would be interesting: gaeng khanoon sii khrong muu. 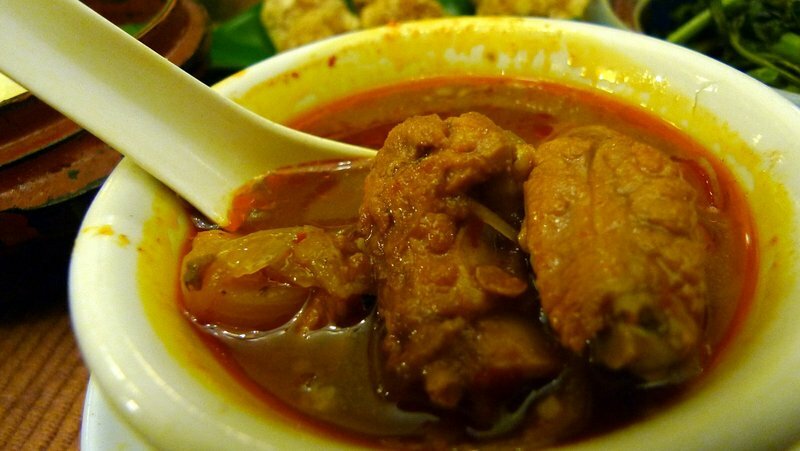 It is a soup made with young jack fruit and pork ribs in a tamarind-flavored broth. I thought this was very tasty and something I would seek out again. 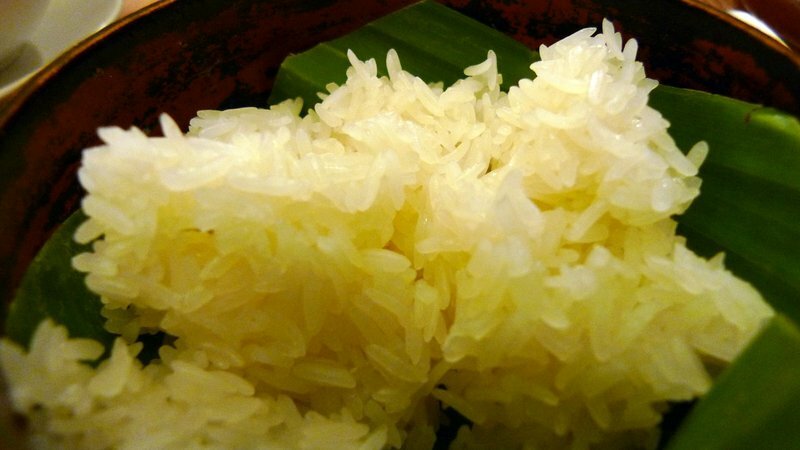 Of course, everything was eaten with this northern staple, khao niaw, or sticky rice. The traditional way is to eat with your hands, pinching off a small amount of rice, rolling it into a ball, and then dipping it into sauces, curries, etc. We used our fork and spoon as is the more contemporary Thai custom. A final dish (although we ate a few more, I did not get photographs of them) was this Northern Thai/Burmese classic, gaeng hong lay. This is a stewed pork dish that has a broth made of tomato and curry. On one level, it bears some resemblance to massaman curry, but that is a much thicker and less tomatoey dish. This dish, which I ate a lot of while in Chiang Mai, is one of my all-time favorite dishes. Our entire meal, which was a ton of food for three people, totaled 900 baht or 30 US dollars. From a Thai perspective, that’s a pricey meal, but by the standards of the quality and quantity of food, it was still quite inexpensive. This entry was posted in Uncategorized and tagged Chiang Mai, cuisine, food, Huen Phen, Restaurant, thai, Thailand by christao408. Bookmark the permalink. I do like the decor. There is a Thai Restaurant about 3 blocks from my home. I have come to make a frequent dining experience. Some of the dishes you had I have enjoyed. The food is excellent and I am learning to communicate with the “mom and pop” who cook. They send the kids out to take the orders in English while hear them back in their native language relaying them to the kitchen. I recall 4 of us having a very good dinner averaging about $10 in Kohn Kaen. Of course, we weren’t ordering one of everything as would a food critic. This amount of food would be way too much for me. looks delicious! 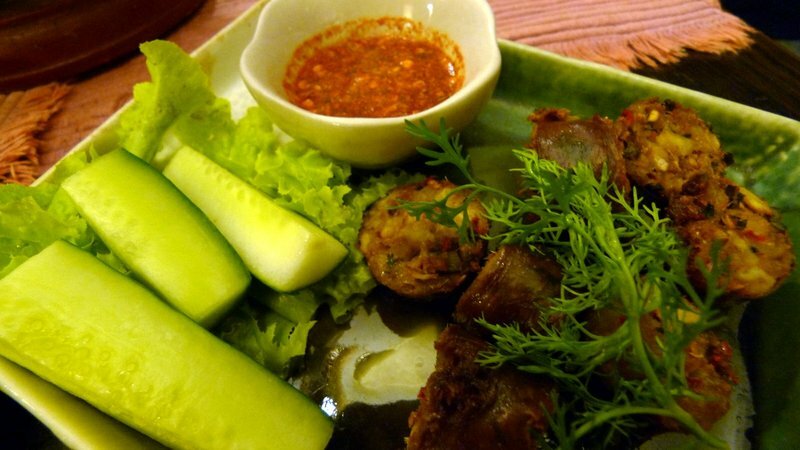 what makes northern thai cuisine distinct? i guess that’s a vague question, but in general terms… like, how northern chinese food tends to be spicier, and southern chinese food often tends to involve soup. Mouthwatering! First Dr. Z’s post and now this one… I may need to have a nibble as these have really started my stomach growling. @CurryPuffy – Too FULL for dessert! =D@Fatcat723 – Of course, the question is whether or not the owners are actually Thai. So few Thai restaurants in the US seem to have Thais in their kitchens. @yang1815 – Alert! Alert! @Ricardo98 – The main reason we ate so much is that the friend we brought there has a prodigious appetite. He was eating for a good twenty minutes past the point that Tawn and I were full. @kunhuo42 – Good question, Aaron. I’ll talk a little bit about what makes Northern Thai food distinct in my final Chiang Mai food post, coming soon. Stay tuned. @murisopsis – Her food post was amazing, wasn’t it? Having eaten at her house, I knew what I was missing, which made it all the more painful to read! =D@grannykaren – Well, a trip to Thailand is always a good idea, I say. Darkly lit streets, dim parking lots, closed restaurant … nothing would deter a foodie like you.